The sheer number of challans being written out each day is mind-boggling. Add to that mix police vehicles that are part of this mad melee. 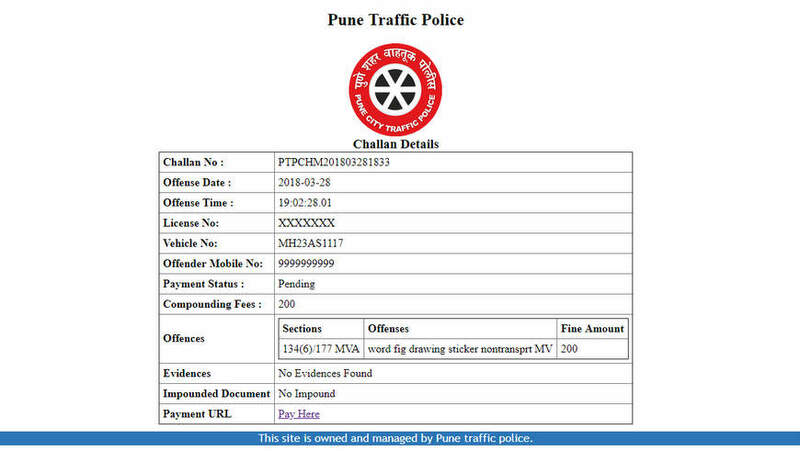 Well, Pune City Police is issuing challans to police vehicles caught in the act. It has been a fruitful week for those airing their grievances to Pune City Police against their own. The sort of interactive twitter account acknowledges complaints tagged to the city police and show a fair amount of interest when photographs of errant road users are posted. Almost all photographs that provide circumstantial evidence of road-rules broken warrant a reply with a request for location of offence, and date and time of offence. 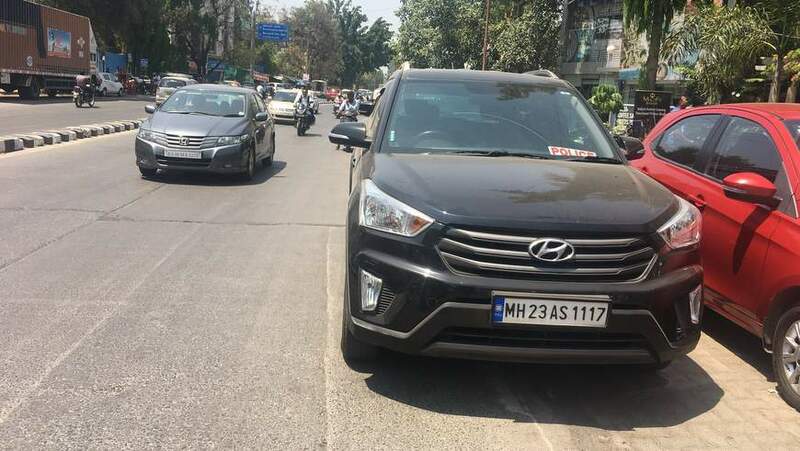 So, when Shrikant Sonawane spotted a marked police car parked on a driving lane, obviously, he questioned the practice and tweeted the incident to Pune City Police. On the same day, 24th March, 2018, the cops responded with their usual ‘thanks for information we are informed to concern traffic divisional officer for take a legal action on this vehicle’ tweet. 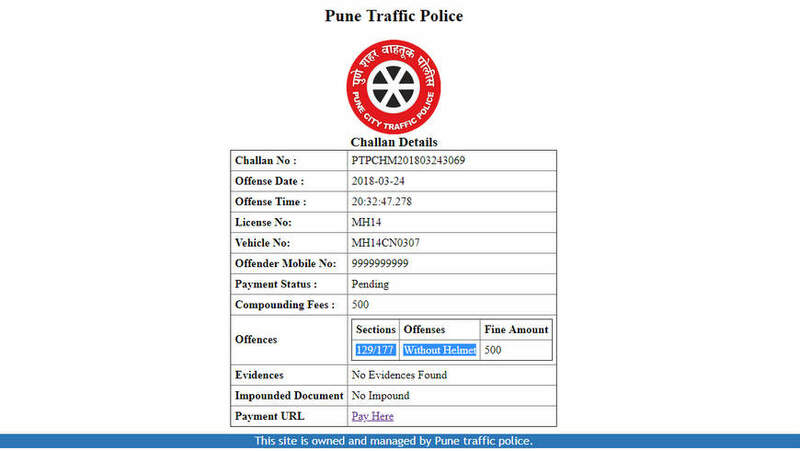 Finally, last evening Pune City Police were back with a response – ‘action taken by PI chaturshrungi sir.’ And this was backed by a screenshot attachment that the errant car had in fact been challan-ed, albeit, 4 days late. 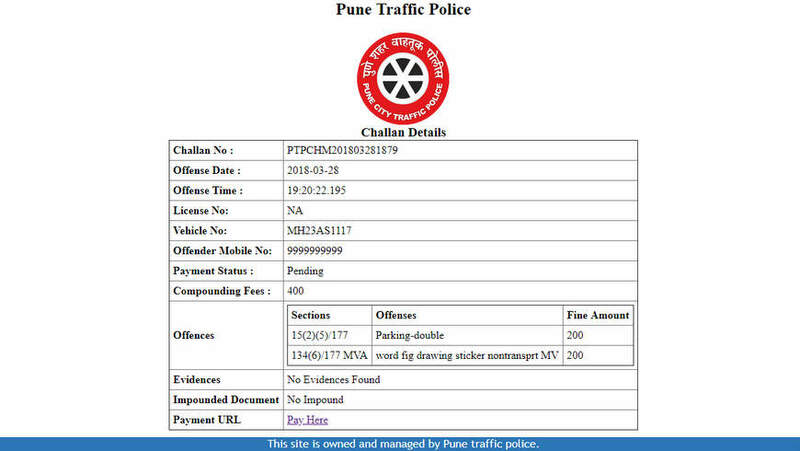 The challans drawn are as follows – Under the category of driving – 134 (6) MMVR / 177 MVA – Using word, figure, drawing , sticker on vehicle (Press, Police, polite,advocate, etc) on non-transport MV. Fine Rs 200. Under the category of parking – 15(2)(v) RRR / 177 MVA – Parking opposite another MV or as obstruction to other vehicle. Fine Rs 200. But not all public grievances are addressed. Here’s a video of an officer refusing to show his credentials and showing who’s boss. Happened with one of my friend today (Kothrud,Pune) where his vehicle was forcefully locked. Another tweet pointing out to an officer riding without a helmet was addressed this week. The challan is drawn under the category of driving – Sec 129 / 177 MVA – Without Helmet. Fine Rs 500.